The severe drought some regions in Spain are currently experiencing, and its impact on agriculture, put in evidence that still today we need better information and tools to prevent the harmful impacts of these events. At the same time, climate change is likely to lead to an increase in the frequency and severity of these kinds of events – in Spain and many other areas of Europe that are predicted to become more drought-prone. Water Exploitation Index+ (WEI+): Indicator used by the European Commission to compare water use against renewable water resources. Sustainable Development Goal indicator 6.4.2 (SDG 6.4.2): Tracks how much freshwater is being withdrawn by all economic activities, compared to the total renewable freshwater resources available. Water Supply Interannual Variability (as in Aqueduct portal): Measures the variation in water supply to agricultural sector across years. Agricultural Exposure to Water Stress (as in Aqueduct portal): A combination of crop production and water stress vulnerability. To assess these water stress indicators, often a mixture of data sources and models are used. However, the disadvantage to this, is that these indicators are often not coherent, are sometimes contradictory and fail to provide an integrated picture of the related problems. Also, often the focus is solely on freshwater and irrigated agriculture, while rainfed agriculture is often the major water consumer and most vulnerable to drought. For water resources management, there is an increasing interest in using so-called Water Accounting frameworks to report on water resources. These frameworks aim to describe water resources in a standardised context, using clear terminology and an established data collection system with known quality standards. There are several frameworks currently being developed or piloted, some even already implemented. Recently, the FAO launched an online discussion among key stakeholders to debate the use of “water accounting” to address water scarcity. Water Accounting+ (WA+) is a new methodology based on global-scale public domain datasets and a multi-institutional effort from international knowledge centers (IWMI, UNESCO-IHE, FAO, and WWAP). This framework has a major focus on agriculture – both rainfed and irrigated. Water stress indicators can be extracted from the water accounts, distinguishing between the main land uses and water users. So far, these frameworks have been used mainly for developing historic water accounts. Little work has been carried out so far on using water accounting for analysing future water stress. Within the IMPREX project, the WA+ framework is being used to evaluate water stress indicators under the current climate as well as future climates. Several case study basins will be analysed using this framework to obtain a pan-European overview of future exposure of the agricultural sector to water stress. The methodology relies heavily on work performed in other components of the IMPREX project such as enhanced climate change projections, improved hydrological models, stakeholder engagement and sectorial integration. The methods are being tested for the Segura basin, for which previously the SEEA (System of Environmental-Economic Accounting) framework was applied. Figure 1. 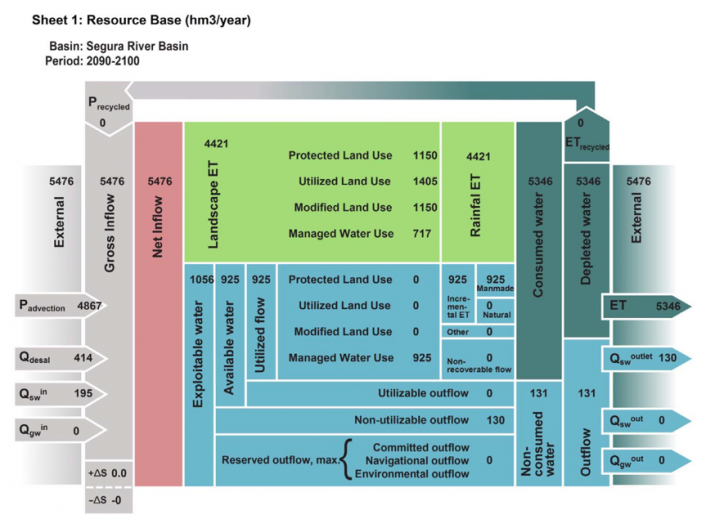 Physical water account (sheet 1 of WA+) for a future scenario of the Segura River Basin. First results have provided insight into changes in water consumption between rainfed and irrigated agriculture in the future situation and have led to estimates of the Sustainable Development Goal indicators. Over the next months, the methodology will be upscaled to other case study basins in IMPREX. Overall, the methodology developed and tested in IMPREX should allow decision-makers at the European level to make better informed decisions on water stress and agriculture, and provide an integrated picture on possible mitigation actions addressing the future water stress situation.